Are you tired of rebuilding the 50+ year old Quadrajet on your classic Chevrolet, GMC, Buick, Oldsmobile, or Pontiac? Introducing Sniper EFI Quadrajet™. The first bolt on spread bore electronic fuel injected throttle body system that does not require any additional adapters, sealing plates, or intake manifold swaps! 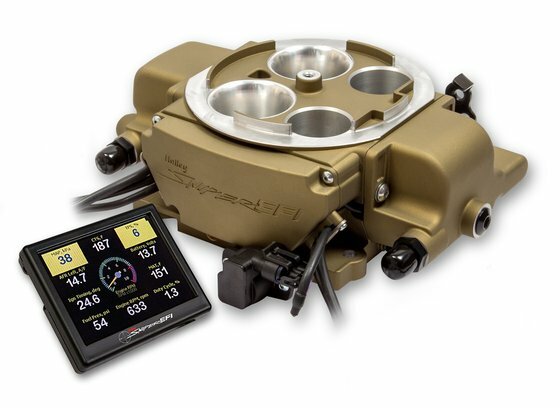 The Sniper EFI Quadrajet™ retains the same great features as the 4150 Sniper EFI version such as; four 100lb/hr Injectors, built in timing control, a 3.5”full color touchscreen and much more! The throttle body will support up to 500 horsepower naturally aspirated. In addition to all of these great tried and true features, the Sniper EFI Quadrajet™ will fit most stock air cleaners and offers multiple fuel inlet configurations that allow for a stock appearing installation! Contact the V8 Speed & Resto Shop Today for ordering information of installation of your Holley Sniper Quadrajet EFI system! Last Edit: 31 Dec 2018 14:26 by oestek.